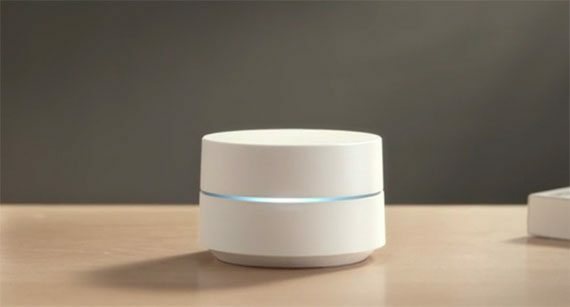 The Google WiFi and Eero are two of the most popular WiFi mesh systems on the market, Eero being one of the pioneers that brought the mesh technology to the consumer-type networking devices, while Google has used its influence and experience to take its Google WiFi and the rest of the WiFi systems into the mainstream and make them the main rivals to the traditional routers. Eero had the advantage of about half a year before the other manufacturers realized the potential of a multi-node approach, but immediately after, Google WiFi outshone almost every other dual-band systems (in terms of stability, wireless performance and especially from the price point of view). During this time, the Eero WiFi system has also undergone multiple changes to become more stable and to deliver a better wireless performance. 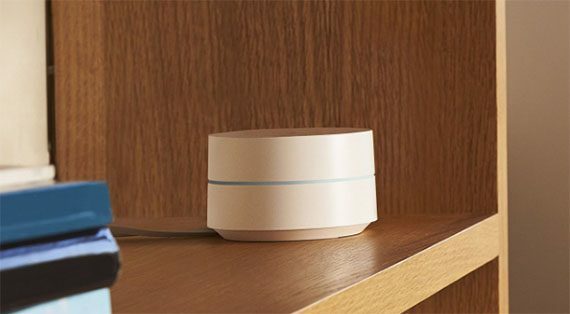 At the same time, the Google WiFi’s dual band approach may not have been enough for more demanding users, so we have witnessed the emergence of the Linksys Velop, the Netgear Orbi and the Asus Lyra, which made it clear that a tri-band approach is the preferred one and Eero responded by releasing a second generation of its WiFi systems (available in multiple configurations). The article was UPDATED on 03.25.2018 to highlight the improvements that both manufacturers have made with the newest firmware updates: Google WiFi has been updated to the v10032.86.2 and Eero Second Generation to the v3.7.0-948 firmware (both routers have received the fix for the KRACK vulnerability). It’s true that Eero and Google WiFi have been each other’s biggest rivals for a long time and now, since Eero has released its second generation of the Home WiFi system (one tri-band main unit + two dual-band Beacon units), it’s time to see if the Google WiFi can maintain its top place as the best budget solution for small to medium homes or if it’s time for someone else to take the crown. Note: You can also check out the individual analysis of each mesh WiFi system here: Eero Home WiFi and Google WiFi. Being one of the first WiFi mesh systems to have been released into the consumer market, Eero had the possibility to create a blueprint for how the future systems will look like and it did have an impact on the design choice of a lot of manufacturers, which, instead of going for the usual alien-head or bug-like large routers, preferred a smaller form factor with a minimalistic look. The first generation of Eero WiFi system consisted of three identical units, each having a small rectangular case, with soft rounded corners and covered by a glossy white finish. With the second generation, Eero made almost no design changes, so the main unit maintains the minimalistic look and it keeps the advantage of being able to be placed almost anywhere (each unit measures 4.75 x 4.75 x 1.24 inches) without attracting too much attention or creating any inconvenience (something that both the Linksys Velop and the Netgear Orbi lack, since their tall units have to be carefully placed). One thing that has changed for the Home WiFi system is that, while before there were three identical units, with the second generation, Eero opted for one main unit and two Beacon units, the latter having a similar design to the tri-band Eero, but, half the size (the case cut in half – it measures 4.76 x 2.91 x 1.18 inches). 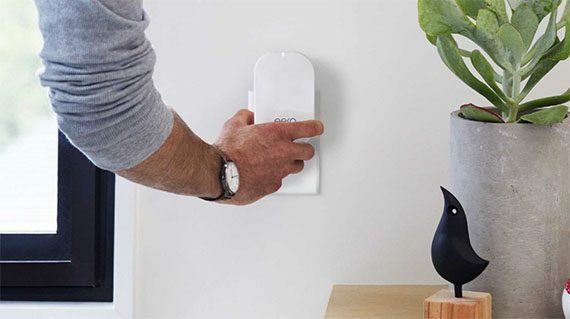 The Eero Beacon is not made to be placed on a flat surface, but inserted into an electricity outlet, being equipped with an integrated plug, just like the satellite units of the Ubiquiti AmpliFi HD (the Beacon also has a nightlight LED with automated dimming). Similarly to the Eero, Google has preferred to go the discrete, small form-factor route, so each of the three units (which are identical) features a cylindrical case, covered by a white finish (slightly glossy, so it may retain a few fingerprints) and with a narrow band cutting the case horizontally (for the LED light). The footprint of the Google WiFi is slightly smaller than the Eero 2nd Gen, its dimensions being 4.17 x 2.70 inches, but, as can be seen, it is almost two times taller. Despite that, the Google WiFi is very robust and, thanks to the rubber bands on the bottom, it will hardly budge (the less elevated feet on the Eero will also do a good job on keeping the device in place). While the larger Velop and Orbi have an abundance of vent holes to keep the devices cool, the Google WiFi seems to lack any relevant cut-out which would indicate a proper heat management (a risk that Google has taken to keep the device as small as possible). 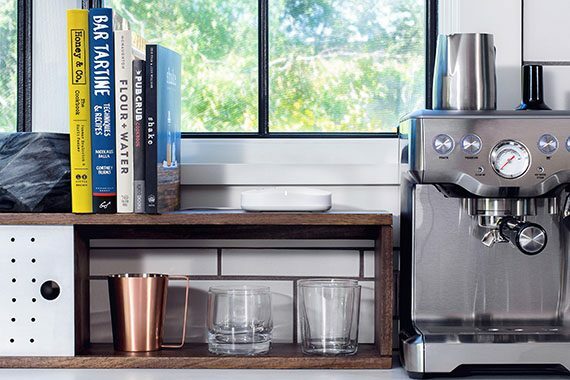 The Eero second gen is guilty of the same omission, but, if kept in the open, neither of the two WiFi systems overheated – although both devices did get warm while functioning (it is advisable to keep the units from direct sun and preferably outside of a cabinet). 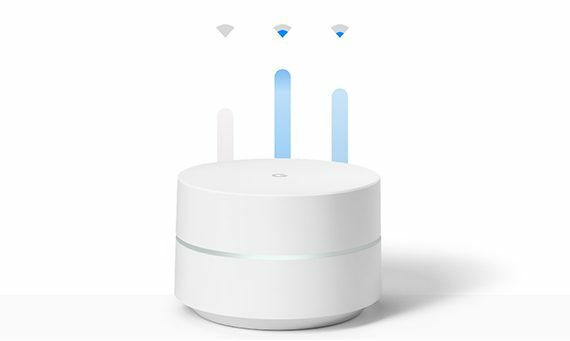 Besides the minimalistic design and the small cases, the Google WiFi and the Eero 2nd Gen also have in common the single LED which has the role of showing the status of the device and to be a useful guide for the set up process. As mentioned a while back, Google has added the LED in the narrow section which cuts through the device, while Eero has kept the LED light on the edge of the device. The LED of the Google WiFi will be a greenish-blue colour when everything is fine with the unit, but it will flash blue when it is downloading an update or when it’s ready for set up. Furthermore, solid blue indicates that the system is going back to the factory default settings, flashing amber means no Internet connection and flashing red indicates an error. The small LED light of the Eero will be solid white when the device is connected to the Internet, it will blink blue when it is broadcasting Bluetooth, it will be solid blue when the device is setting up, while blinking green indicates multiple errors and solid red shows that there is no Internet connection. I understand that these new WiFi systems value simplicity, so a single LED light which shows the status of the device by using various colours may seem the next natural step from the array of LED indicators of the traditional router, but, unfortunately, the system is far from intuitive and the user will most likely end up using the guide to understand what’s going on (voice confirmations could have been a better choice and, thankfully, Eero supports Amazon Alexa integration). If we compare the Eero main unit to any Google WiFi node, we’d notice that both devices have two 10/100/1000M Ethernet ports (the Google WiFi has them inside a carved area, on the bottom, while Eero has kept everything on the rear side), both have a Reset button (to return to factory default settings) and both use a USB type-C port adapter for powering up the units. Furthermore, the Ethernet ports on either systems can act as either WAN or LAN and in the case of Google WiFi, only the main unit will have a port to take the role of WAN, while any other connected node will automatically have two LAN ports available. But Eero has made an odd choice and decided not to add any Ethernet ports on its Beacon units, so, only wireless clients can connect to them and it also takes the Ethernet backhaul off the table (something that the Google WiFi takes full advantage of). Verdict: Both the Google WiFi and Eero Home WiFi have adopted a minimalistic design approach which works great for this type of devices, allowing for an easy deployment pretty much anywhere in the house, but, while I appreciate change, I feel that Eero may have made a mistake when it decided not to add any Ethernet port on its Beacon units, so, Google WiFi wins this round because of its two ports on every unit (I have to acknowledge that the Eero Pro pack has three identical units, each featuring 2 Ethernet ports, but the price tag is also significantly higher). Google has equipped every Google WiFi unit with a quad-core Qualcomm Atheros IPQ4019 chipset clocked at 717 MHz (ARM Cortex-M0 processor), a Qualcomm Atheros QCA8075 Gigabit Switch, an Infineon Trusted Platform Module STM9615 controller, 4GB eMMC flash memory / 4MB Winbond 25Q64FV and 512MB of RAM (both the 2.4GHz and the 5GHz radios use the Qualcomm Atheros IPQ4019 chip). Eero is built on the same Qualcomm platform (as well as almost all mesh WiFi systems), so it also features a quad-core Qualcomm IPQ4019 chipset clocked at 717 MHz, 4 GB of flash memory and 512 MB of RAM (the 2.4GHz radio and the first 5GHz radio use a Qualcomm IPQ4019 chip, while the second 5GHz radio uses a Qualcomm QCA9886 SoC). 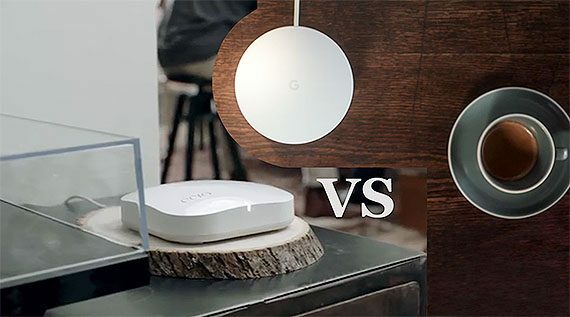 Both of these devices have the potential of functioning as a smart home hub, the Eero taking advantage of the Bluetooth LE 4.2 and the Thread 1.1 Border Router (an upcoming alternative to ZigBee and Z-Wave – users will have to wait a while until it will be implemented in new devices to fully take advantage of all its features), while Google WiFi is equipped with the ZigBee technology and with Bluetooth 4.2. The maximum theoretical data transfer rate of Google WiFi is 300 Mbps using the 2.4GHz radio and it is 867 Mbps using the 5GHz radio. The maximum theoretical data transfer rate of the main Eero unit is 240 Mbps using the 2.4GHz radio band and it is 600 Mbps for each of the two 5GHz radio bands. Verdict: Even if at first glance the Google WiFi may have a slight advantage, the third radio of the Eero Home WiFi can make a difference (no matter if it’s just one unit that takes advantage of the tri-band approach), so it wins this round. 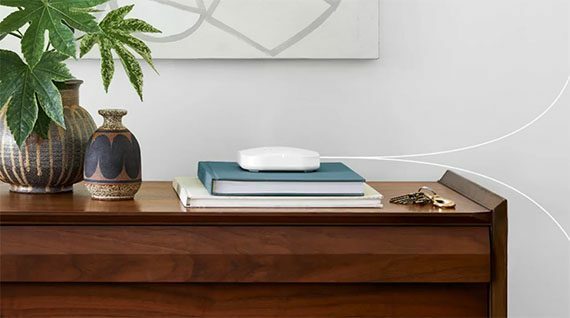 The second generation of Eero is the latest WiFi system to join the tri-band group, along with Linksys Velop, Netgear Orbi and Asus Lyra, and the reason the manufacturer decided to go this route is to allow more clients to be connected to the network, while maintaining the system as stable as possible and to properly handle the backhaul traffic. But, unlike Netgear Orbi, which did not want to go through the hassle of dynamically steer the backhaul traffic through the wireless bands or Ethernet and it dedicated a 5GHz radio band for the communication between node, Eero has left all three radios available to the clients and for the backhaul traffic. Now, if you decided to go with the Eero Pro package, you get three identical devices which will give you a better wireless performance and Ethernet backhaul, but, since the Beacons units of the Home WiFi System are dual band, you will get a slower wireless performance and, because they lack any Ethernet port, you won’t be able to take advantage of the Ethernet backhaul (which can provide a high degree of relief to a crowded network). The Google WiFi is a dual-band system without a dedicated radio band for the backhaul, but it can take advantage of the Ethernet backhaul through all of its units. For people that may be severely inconvenienced by the lack of Ethernet ports on the Beacon units and don’t want to pay extra for the Pro pack, the Eero first generation along with one tri-band Eero could be a better choice (especially if you already own the first gen devices – Eero has promised that the the first gen system will be kept updated for a long time). 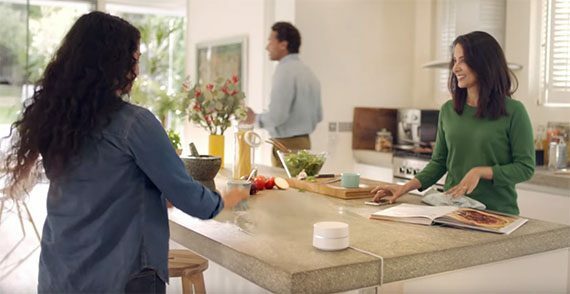 It’s not only Eero that can connect to other Eero nodes from the previous generation, Goggle WiFi will also work with both generation of Google OnHub (so it’s easy to create a larger network if you already own a Google router). Furthermore, the Eero Home system is quite closely related to the tri-band Linksys Velop and the dual-band Google WiFi since it has implemented the mesh technology. The Google WiFi uses the IEEE 802.11s mesh architecture which means that the three units work together to cover a larger area, while allowing the clients to roam seamlessly from point to point. This highlights a few of the main properties of the mesh technology. The first one is the scalability, which means that you can add a larger numbers of nodes (routers) to the network and the Google WiFi uses the Network Assist tech to determine which is the fastest route for the data by scanning the wireless spectrum and analysing which is the closest and most convenient node (the least crowded), so the data will safely reach its destination. The second property is the self-healing feature, which ensures that, in case a node fails, data will get rerouted through the existing nodes (once again, the Google WiFi analyses the closest and the least crowded node with the strongest signal), so it will always reach it destination (therefore, you won’t experience any downtime). The Network Assist goes further than that and it also ensures that each wireless client connects to the most suitable band (so the 2.4GHz radio doesn’t get overcrowded). Furthermore, the Network Assist allows for a smooth transition between nodes, so you won’t experience any disconnects while you roam a larger area. Eero has named its approach at the mesh technology, TrueMesh™ and the way it functions it’s pretty much similar to how the Google WiFi works: scalability, adaptability and auto-healing. To also allow a continuous roaming experience through a larger area, Eero takes advantage of a different technology, supporting 802.11r Fast BSS transition, which has the role of making sure that the nodes in the vicinity are already associated, so the wireless client connected to the network won’t have to re-authenticate at every new node.